CHICAGO, May 20 – In ideal conditions for runners but less than comfortable temperatures for spectators, thousands of Chicagoans in Grant Park today participated in the 10th annual Byline Bank Chicago Spring Half Marathon and 10K, produced by Life Time®—Healthy Way of Life. Before heavy rains impacted the sold-out event, individuals representing 40 different states and 25 countries among the 8,000 registrants toed the line in Maggie Daley Park and then ran either a half-marathon (13.1 mile) or 10K (6.2 mile) course, ending at the finish line at Monroe and Columbus. The one-loop half marathon and 10K courses ran through Chicago’s historic and scenic museum campus alongside Soldier Field and along the city’s beautiful lakefront path. More than $150,000, including a $5,000 donation from Byline Bank, was raised to support the event’s charitable partner, the Muscular Dystrophy Association (MDA). Throughout the four-year partnership more than $400,000 has benefited the MDA. The winners of today’s event were Arturs Bareikis and Jane Bareikis, both of Midlothian, IL. 31-year-old Bareikis won the men’s half marathon in a time of 1:10:02. 23-year-old Bareikis won the women’s half marathon in a time of 1:19:45. They both received $1,000 in prize money. The Byline Bank Chicago Spring Half Marathon/10K is the first of two races in the 2018 Chicagoland Half Marathon Series, which also includes the Chicago Half Marathon on September 23, 2018. Participants who complete in both half marathon distances earn a custom, 26.2 Challenge finisher medal at the final event. Currently, more than 2,000 athletes are registered for the Series. 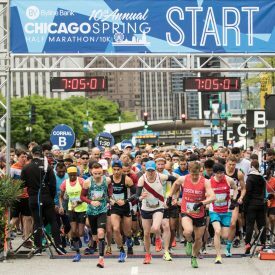 With a record number of runners, this year’s Byine Bank Chicago Spring Marathon and 10K race sold out – 2019 registration will open at noon on Tuesday, May 22, 2018, at ChicagoSpringHalf.com.